So, on my journey home from the Ugandan refugee camps we had several flights. Now, I am not a huge fan of flying (like biggest understatement ever!). I had braced myself for not one, not two, but three flights. Bus ride to the ferry. Ferry ride across the Nile (oh yeah, the Nile, like that same body of water that Moses floated down. I know, beyond cool, right?) to a small, like baby tiny airplane. I detest these little planes. I mean they aren’t even really planes. They are like tin cans with make-shift wings attached. I hate how everyone acts like it’s no big deal that we are getting into what looks like an oversized child’s toy that could be flipped upside down and sent spiraling to the ground with one heavy gust of wind. But, in we went. An hour and a half of my life, I said, having a stern talking to with myself, I can do this. I can do this. And about thirty minutes in I knew I had a bigger problem than if we would survive this flight. I had to go to the bathroom. Like bad. Now, that might not seem like a huge deal to you… that is unless you have had children, particularly multiple children. Am I right, moms? Then you get my panic. Aaaaaand that lasted all of 10 minutes. I then turned to breathing exercises I learned but never used in labor. I made it another fifteen minutes or so, unbuttoning my pants to make room for my ever-expanding bladder. And then it hit me… I soooo do not have this. I am for sure not going to make this. I looked behind me as if a toilet would magically appear. Nothing. Just parachutes… like who needs parachutes! We need a toilet, people- anything- a baby potty- something!!! Mike, how much longer do we have? Cuz, I’m not going to make it, I explained. And by the look on my face he knew I was totally serious. I’m going to have an accident if I don’t go, like now. Yes… Yes, all pride was out the door. Gone. I didn’t care. I was going to explode. In these moments, dear sisters, we really don’t care what someone thinks of us, right? It’s about survival… the survival of my bladder. He started to laugh. “Oh my gosh! This has never, I mean like never happened before,” he added. Yeah, well you can thank me later, what the heck am I going to do, I questioned, looking out the window at the ground below, because in my mind this seemed like an emergency landing kind of situation. Nathan, the doctor that was traveling with us, turned around to hear what was going on. He reached into his bag and dumped out a gallon-size ziplock bag. “I’ve got this,” he chipped in, holding up the empty bag. I didn’t think twice, Give it to me, I demanded, reaching for the bag. “Here are some wipes too,” he added. Fantastic…. just fantastic. I grabbed them both as the two extremely humored men instructed all six passengers (all men and only one woman, of course) to keep their eyes forward. I made my way to the back, behind the last seat of chairs. Oh, this is not good. I positioned myself on a piece of wood that covered the back of the plane and pulled my pants down in one quick swoop. With one hand I grabbed the seat in front of me and the other…. well, I attempted to ummm, position the bag. Every imaginable image went through my head in like a split second. What if i miss the bag and it sprays all over the ground? What if we hit turbulence and I fall over and urine goes pouring out making its way through each seat? What if we hit a huge bump and I fall over, hitting the little flimsy door which pops open with the force of my weight and I fall to my death with my pants down around my ankles, clutching a bag of pee?!!!!! And then it hit me… and I stopped. 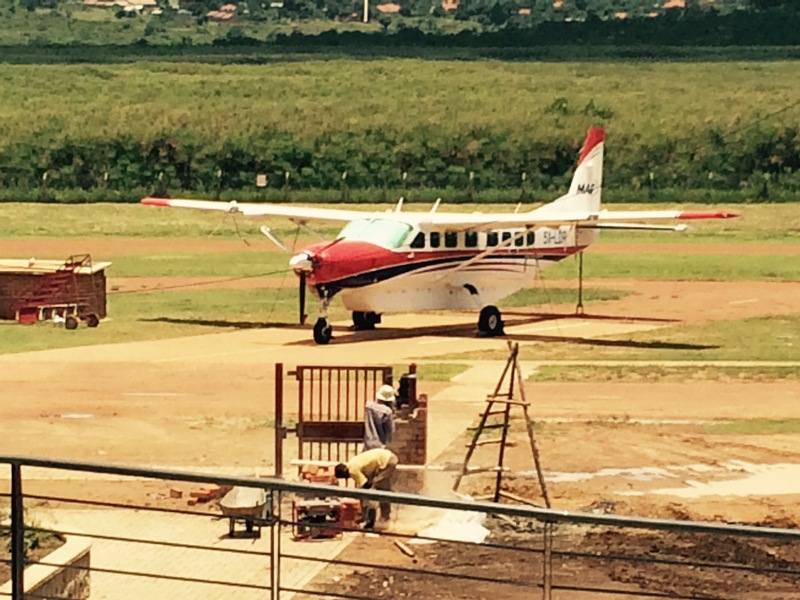 I am flying in a small little plane over Uganda with my pants down urinating in a bag! Lord! Lord! How in the world did I end up here? I don’t even recognize my life. We have those moments every now and then, dear sisters, don’t we? We have those moments where life catches us by surprise. It stuns us. Stops us in our tracks. Sometimes it is in deep sorrow. Other times in our greatest of joy. Or like this fun little adventure, it catches us in complete surprise as we marvel at the though that never never never, in a million years, never could I have imagined I would be where I was doing exactly what I was doing. And, I have to think, dear sisters, that it is in these snap shots of life, God is up to something. He is…. He is up to a story. He is up to creating an adventure. He is up to making us smile, our eyes dancing with delight. He is up to teaching us a valuable lesson. He is up to growing us. He is, dear sisters. In his love- out of his love- He is always up to something. ← Mom, what’s wrong with the bunny?